Sometimes I have a t-rex "god"
It's both interesting and embarrassing how many times I edit my prayers before offering them to God. I truly believe He is capable of answering and addressing any and every situation, emotion, and challenge that I find myself bumping up against on any given day (not to be confused with what He decides is best or what is the best timing but that's another discussion for later). I often try to solve things for God rather than surrendering things to him in their jacked up seemingly impossible state. Simply stated: I edit...and I bet some of you do as well. Today I believe God allowed Numbers 11:23 to reverberate in my conscience like a thunderous cloud. Go back and read the context for yourself, but Moses was facing an impossible situation and he essentially told God it wasn't possible. God's response, "Is the LORD's arm too short?" I appreciate my Creators sarcasm! God was saying, I'm not limited by your inability to see the solution. My version, "Moses, Do you think I have t-rex arms?" Just because you and I can see our way through it doesn't mean we shouldn't pray our way through it. 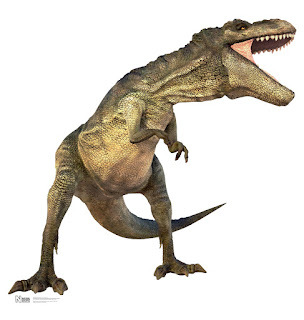 I'm still learning, but if you, like me, at times have a t-rex "god" I would suggest that you pick a new God. Maybe we should consider the One that was talking to Moses in Numbers 11:23!